Pressure ulcers are a significant iatrogenic cause of morbidity and mortality in the aged care population, with prevalence reported to be as high as 43% in some aged care facilities. The PRIME trial was a 15-month pre- and post-intervention study designed to investigate the effectiveness of an integrated pressure ulcer management system consisting of pressure ulcer risk assessment tools, Australian Wound Management Association (AWMA) guidelines, digital imaging and clinical education in reducing pressure ulcer prevalence in residential aged care facilities. A total of 1228 residents from 23 residential aged care facilities were enrolled in this Commonwealth-funded study. The findings suggest that the PRIME intervention significantly reduced pressure ulcer prevalence risk by 52% (p<0.001) and highlighted the association between cachexia, Braden sub-scales for activity, nutrition, friction/shear and pressure ulcer risk. The study also demonstrated that following the PRIME intervention, the use of appropriate pressure ulcer risk reducing equipment was significantly increased. 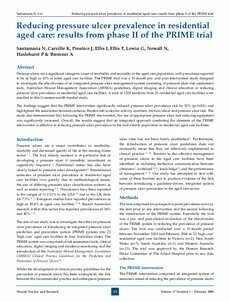 Overall, the results suggest that an integrated approach combining the elements of the PRIME intervention is effective in reducing pressure ulcer prevalence in the frail elderly population in residential aged care facilities.